Two friends in New York City dated for 40 days as an experiment. Their blog 40 Days of Dating went viral, and now the pals have a movie deal with Warner Bros., according to Deadline [via Gawker]. Designers Jessica Walsh and Timothy Goodman take opposite approaches to love and relationships. Walsh describes herself as a "hopeless romantic who jumps into relationships very quickly," while Goodman admits he's "afraid of commitment and tends to date many girls at the same time." They chose the 40-day mark, because it's said that it takes 40 days to change a bad habit. We don't want to ruin the ending for you, but you can probably guess how things wind up. "As the cab driver pulled up to my apartment, we laughed because it was literally 11:57 p.m. as day 41 was approaching. I just can’t believe it’s over," the navel-gazing entry for day 40 reads. The experimental relationship has been heavily criticized because Walsh and Goodman seemed to be trolling for some kind of deal from the get-go. The design-savvy blog made sense given Walsh and Goodman's profession, but it also felt ready-made for an overpriced book (and eventual screenplay). 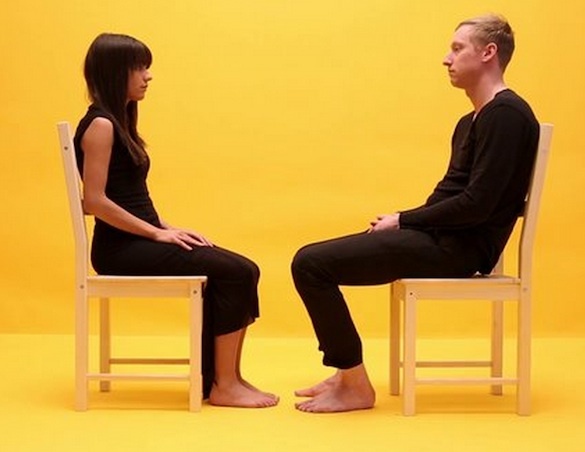 Minimalist videos of the couple with overused arty angles didn't help matters — as in the case of this short clip explaining the rules of the "relationship." Gawker calls it insufferable, and we tend to agree, but let us know if you see this future film going beyond the cookie-cutter rom-com or nauseatingly quirky hipster something or other.